You're a high level Manager who has responsibility for employees, offices and infrastructure throughout the whole State, or maybe even Australia wide. Or perhaps you are a field worker who needs to roam around this great country of ours doing your job, which also means you often come up against the elements? How do you keep an eye on what severe weather, bushfires or damaging winds are likely to affect you or your operations? The truth is, you can't, and neither can your company... Unless you have somebody else on the job, 24/7, 365 days a year, looking out for you. Someone who can filter out all the duplicate alerts you don't need, then push them to you via SMS and email, at the first sign of trouble. Now you can get on with what you do best, your business, while EWN takes care of your weather and other severe hazard risks. 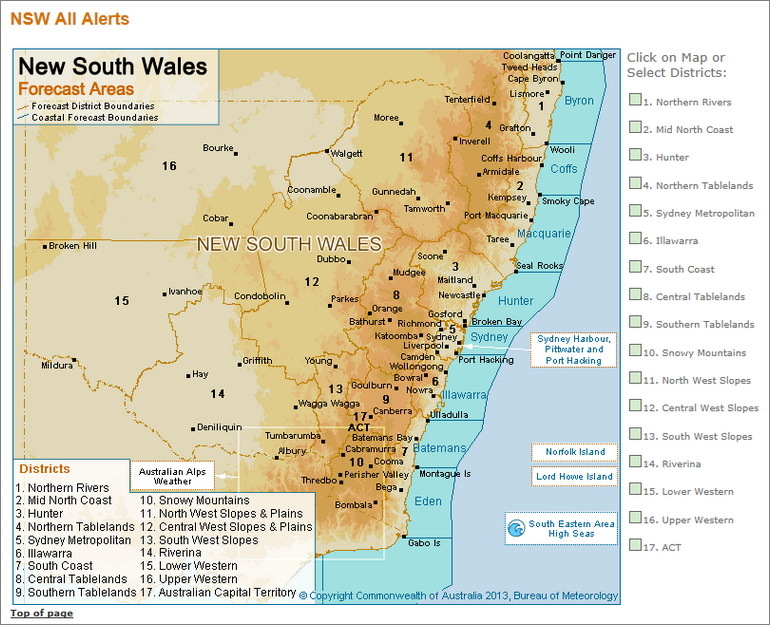 Simply select the Districts on the BoM maps of Australia that you would like alerts for, advise contact details for those who need the alerts and how you would like to receive them (SMS, Email or both).